J.D. Salmon-Williams (Brampton, Ont.) hit .294 for rookie-class Billings with two homers and four RBIs. Salmon-Williams a former Ontario Blue Jays was drafted in the 17th round by Cincinnati Reds scout Bill Byckowski. 92 Canadians who are active (or have been) on minor league rosters of affiliated major-league teams this season. Another 17 are playing in foreign lands and 43 more are in independent ball bringing the weekly total to 152 Canadians who have appeared in at least one game. Although the total shows 152 it is actually 146 since six players (Jamie Romak, Dustin Molleken, Evan Rutckyj, Jared Mortensen, Jon Fitzsimmons and Karl Gelinas) have appeared at two different levels. Last season there were 149 active players.. Bold indicates player has been, or is currently with, the Major League team. R-Indicates player injured, on rehab assignment or on the disabled list. X-Denotes player has been released or returned to extended. Statistical data included below, reflects Minor League games played up to and including Sept. 13, 2017. RHP Curtis Taylor, Port Coquitlam, BC (0-0, 0.00) rookie-class AZL Diamondbacks; (3-4, 3.32) Single A Kane County Cougars. C Andrew Yerzy, Toronto, Ont. (.298, 13, 45) Rookie Class Missoula Osprey. RHP Jake Polancic, Langley, BC (2-5, 7.38) Rookie Class AZL Diamondbacks. 1B Luke Van Rycheghem, Kent Bridge, Ont. (.162, 2, 12) Rookie Class AZL Diamondbacks. 3B Freddie Freeman, Fountain Vallley, Calif. (.667, 0, 0) Triple A Gwinnett Braves. RHP Michael Soroka, Calgary, Alta. (11-8, 2.75) Double A Mississippi Braves. LHP Travis Seabrooke, Peterborough, Ont (3-9, 5.01) Single A Delmarva Shorebirds. C Chris Shaw, Winnipeg, Man. (.189, 2, 14) Single A Delmarva Shorebirds; (.063, 0, 0) Rookie-Class Gulf Coast Orioles. SS Adam Hall, London, Ont. (.667, 0, 2) Rookie Class Gulf Coast Orioles. C Jordan Procyshen, Calgary, Alta. (.200, 4, 21) Double A Portland Sea Dogs. LHP Rob Zastryzny, Edmonton, Alta. (2-3, one save, 5.94) Triple A Iowa Cubs; (0-1, 1.04) Rookie Class AZL Cubs. 3B Jesse Hodges, Victoria, BC (.268, 13, 63) Single A Myrtle Beach Pelicans. LHP Ryan Kellogg, Whitby, Ont., (5-7, 5.21) Single A Myrtle Beach Pelicans. 2B Jared Young, Prince George, BC (.257, 1, 14) Single A Eugene Emeralds. RHP Bryan Saucedo, Toronto, Ont. (3-2, 7.04) Rookie Class AZL White Sox. 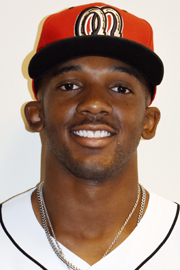 OF Malik Collymore, Mississauga, Ont (.375, 1, 5) Single ADaytona Tortugas; (.222, 3, 12) Single A Dayton Dragons. RHP Alex Webb, Surrey, BC (1-4, two saves, 4.84) Single A Dayton Dragons; (0-0, 3.52) Rookie Class AZL Reds. 1B Bruce Yari, Waterloo, Ont. (.252, 13, 54) Single A Dayton Dragons. C Morgan Lofstrom, Kelowna, BC (.300, 0, 0) Single A Dayton Dragons; (.202, 1, 12) Rookie Class Billings Mustangs. OF Miles Gordon Oakville, Ont. (.319, 8, 37) Rookie Class Billings Mustangs. INF J.D. Salmon-Williams, Brampton, Ont. (.224, 4, 11) Rookie Class Billings Mustangs. LHP Isaac Anesty, Guelph, Ont. (0-2, 7.13) Rookie Class AZL Reds. R-RHP Darren Shred, Brampton, Ont. (1-0, 0.00) Rookie Class AZL Reds. RHP Jordan Scheftz, North York, Ont. (1-2, 6.33) Rookie-class Azl Indians..
OF Jim Adduci, Burnaby, BC (.288, 4, 27) Triple A Toledo Mud Hens. X-RHP Dustin Molleken, Regina, Sask. (2-1, 2.76) Triple A Toledo Mud Hens. OF Jacob Robson, Windsor, Ont. (.277, 2, 18) Single A Lakeland Flying Tigers. (.329, 1, 27) Single A West Michigan Whitecaps. OF Cole Bauml, Meunster, Sask. (.268, 1, 55) Single A West Michigan Whitecaps. SS Daniel Pinero, Toronto, Ont. (.289, 4, 56) Single A West Michigan Whitecaps. R-RHP Kyle Thomas, New Tecumseth, Ont. (0-0, 1 save, 6.00) Rookie Class Gulf Coast Tigers - West. RHP Brock Dykxhoorn, Goderich, Ont. ; (3-5, one save, 4.62) Double A Corpus Christi Hooks; (0-0, 0.00) Single-A Tri City Valley Cats. X-RHP Jared Mortensen, Abbotsford, BC (0-0, 0.00) Single-A Tri City Valley Cats; (0-0, 13.50) Triple A Fresno Grizzlies. 3B Abraham Toro-Hernandez, Greenfield Park, Que. (.209, 9, 17) Single-A Quad Cities River Bandits (.288, 6, 16) Single A Tri City Valley Cats. R-OF Jonathan Lacroix, Montreal, Que. (.000, 0, 0) Rookie ClassGulf Coast Astros. R-LHP Conor Lillis-White, Toronto, Ont. (3-4, two saves 4.03) double-A Mobile Bay Bears (2-0, 3.63) Single-A Inland Empire 6’ers; Rookie Class, (0-0, 0.00) AZL Angels. X-LHP Jon Fitzsimmons, London, Ont. (0-1, 10.64) Single A Inland Empire 66’ers; (1-1, 2.25) Double A Mobile Bay Bears. RHP Daniel Procopio, Toronto, Ont. (2-2, three saves, 2.49) Rookie Class Orem Owlz. RHP Zach Pop, Brampton, Ont. (0-0, 0.00) Rookie Class AZL Dodgers. C J.D. Osborne, Whitby, Ont. (.226, 0, 10) Rookie Class Gulf Coast Marlins. C Dustin Houle, Penticton, BC (.225, 1, 18) Double A Biloxi Shuckers. OF Demi Orimoloye, Orleans, Ont. (.214, 11, 45) Single A Wisconsin Timber Rattlers. RHP Kody Rock, Canora, Sask. (2-0, four saves, 3.66) Rookie Class AZL Brewers. 1B Matt Hague, Toronto, Ont. (.297, 10, 65) Triple A Rochester Red Wings. X-LHP Kevin Chapman, Coral Springs, Fla. (0-1, 5.56) Triple A Rochester Red Wings; (0-0, 7.71) Triple A Gwinnett Braves. RHP Jordan Balazovic, Mississauga, Ont. (1-3, 4.91) Rookie Class Gulf Coast Twins. LHP Matt Jones, Whitby, Ont. (2-1, two saves, 3.94) Rookie Class Gulf Coast Twins. RHP Landon Leach, Pickering, Ont. (2-0, 3.38) Rookie Class Gulf Coast Twins. LHP Kurtis Horne, Sooke, BC (0-0, one save, 11.37) Single A Brooklyn Cyclones. OF Raphael Gladu, Trois Rivieres, Que. (.269, 2, 14) Rookie class Kingsport Mets. X-LHP Evan Rutckyj, Windsor, Ont. (0-0, 13.50) Double A Trenton Thunder. LHP Jeff Degano, Surrey, BC (0-0, 63.00) Single A Staten Island Yankees. RHP John Axford, Simcoe, Ont. (0-0, 0.00) Triple A Nashville Sounds. OF Brett Siddall, Windsor, Ont. (.300, 21, 68) Single A Stockton Ports. RHP Marc Berube, Trois Pistoles, Que. (2-2, one save, 3.92) Single A Vermont Lake Monsters. SS Jake Lumley, Windsor, Ont. (.333, 0, 25) Rookie Class AZL Athletics. RHP Nick Pivetta, Victoria, BC (5-0, 1.41) Triple A Lehigh Valley Iron Pigs. RHP Jesen Therrien, Montreal, Que. (0-2, two saves, 1.57) Triple-A Lehigh Valley; (2-1, seven saves, 1.26) Double A Reading Fightin` Phils. OF Ben Pelletier, Varennes, Que. (.333, 3, 26) Rookie Class Gulf Coast Phillies. RHP Jameson Taillon, The Woodlands, Tex. (0-1, 4.09) Triple-A Indianapolis; (0-0, 0.00) Double A Altoona Curve. 3B Eric Wood, Pickering, Ont. (.238, 16, 61) Triple A Indianapolis Indians. RHP Austin Shields, Hamilton, Ont. (4-1, 4.43) Rookie Class Gulf Coast Pirates. OF Tyler O’Neill, Maple Ridge, BC (.253, 12, 39) Triple-A Memphis; (.243, 17, 51) Triple A Tacoma Rainiers. RHP Rowan Wick, North Vancouver, BC (2-1, one save, 5.40) Triple A Memphis Redbirds; (0-0, five saves, 2.08) Double-A Springfield Cardinals; (0-0, 0.00) Rookie Class Gulf Coast Cardinals..
3B Francisco Hernandez, Montreal, Que. (.200, 3, 10) Rookie Class Dominican Summer League Cardinals. X-OF Jamie Romak, London, Ont. (.347, 11, 25) Triple A El Paso Chihuahuas. 1B Josh Naylor, Mississauga, Ont. (.250, 2, 19) Double-A San Antonio; (.297, 8, 45) Single A Lake Elsinore Storm. RHP Cal Quantrill, Port Hope, Ont. (1-5, 4.04) Double-A San Antonio; (6-5, 3.97) Single A Lake Elsinore Storm. R-1B T.J. Bennett, Lethbridge, Alta. (.242, 1, 4) Double A Richmond Flying Squirrels; (.286, 1, 2) Triple-A Sacramento; (.195, 1, 5) Single-A San Jose Giants. RHP Dylan Rheault, Garson, Ont. (2-1, 21 saves, 2.70) Single A San Jose Giants. R-LHP James Paxton, Ladner, BC (0-0, 4.50) Double A Arkansas Travelers. LHP Andrew Albers, North Battleford, Sask. (0-0, 0.00) Triple A Tacoma Rainiers; (12-3, 2.61) Triple A Gwinnett Brav1es. 0-0,0.00) Rookie Class Danville Braves. OF Gareth Morgan, Toronto, Ont. (.230, 17, 61) Single A Clinton Lumber Kings. SS Louis Boyd, North Vancouver, BC (.261, 0, 2) Single A Clinton Lumber Kings; (.250, 0, 5) Single AEverett Aquasox; (.321, 0, 25) Rookie Class AZL Mariners. X-RHP Reign Letkeman, Red Deer, Alta. (1-0, 5.79) Single A Hudson Valley Renegades. LHP Adam Loewen, Surrey, BC (6-0, 4.60) Triple-A Round Rock: (0-1, one save, 3.48) Double A Frisco Roughriders. INF Charles Leblanc, Laval, Que. (.262, 4, 19) Class-A Hickory Crawdads; (.190, 0, 2) Single A Spokane Indians. OF Michael Saunders, Victoria, BC (.274, 2, 12) Triple A Buffalo Bisons. R-OF Dalton Pompey, Mississauga, Ont. (.118, 0, 1) Triple A Buffalo Bisons; (.259, 0, 5) Single A Dunedin Blue Jays. RHP Andrew Case, St. John, NB (4-0, eight saves, 1.58) Double-A New Hampshire; (0-0, 5.87) triple-A Buffalo Bison;(3-1, four saves, 4.42) Single A Dunedin Blue Jays. LHP Shane Dawson, Drayton Valley, Alta (4-9, 6.16) Double A, New Hampshire Fisher Cats. R-RHP Tom Robson, Ladner, BC (0-0, 2.45) double-A New Hamshpire Fisher Cats; (1-3, one save, 3.12) Single A Dunedin Blue Jays. X-C Mike Reeves, Peterborough, Ont. (.169, 2, 6) Single A Dunedin Blue Jays; (.286. 0, 2) Double-A New Hampshire. INF Connor Panas, Toronto, Ont. (.276, 18, 55) Single A Dunedin Blue Jays. RHP Jordan Romano, Markham, Ont. (7-5, 3.29) Single A Dunedin Blue Jays. 3B Vladimir Guerrero, Montreal, Que. (.333, 6, 31) class-A Dunedin Blue Jays (.312, 7, 45) Single A Lansing Lugnuts. 2B Mattingly Romanin, Burlington, Ont. (.200, 0, 7) Single A Vancouver Canadians; (.204, 0, 10) class-A Lansing. RHP Brayden Bouchey, White Rock, BC (1-1, 4.20) Single A Vancouver Canadians. R-Tanner Kirwer, Sherwood Park, Alta. (.224, 1, 10) Rookie Class Bluefield Blue Jays. INF-OF Otto Lopez, Monteal, Que. (.275, 1, 15) Rookie class FLA Gulf Coast Blue Jays. OF Eric Senior, Toronto, Ont. (.267, 1, 2) Rookie Class Gulf Coast Nationals. RHP Scott Mathieson, Abbotsford, BC (3-3, two saves, 1.81) Yomiuri Giants. LHP Scott Diamond. Toronto, Ont. (8-6, 4.50) SK Wyverns in Hangul, South Korea. 3B Jamie Romak, London, Ont. (.231, 27, 54) SK Wyverns. RHP Scott Richmond, North Vancouver, BC (6-7, one save, 4.97) Fubon Guardians. 1B David Burns, Vernon, BC (.346, 0, 11) Attnang-Puchheim Athletics. LHP Tyson Walker, Chilliwack, BC (2-0, 6.43) Prague Eagles. OF Anthony Cros, Kelowna, BC (.421, 0, 5) Montpelier Barracudas. RHP Gregory Cros, Kelowna, BC (3-0, 0.82), (.000, 0, 1) Montpelier Barracudas. 2B Braydon McNabb, Guelph, Ont. (.247, 1, 13) Savigny-Sur-Orge Lions. RHP Nolan McNabb, Guelph, Ont. (0-1, two saves, 5.06) Savigny-Sur-Orge Lions. LHP Sean Callegari, Vancouver, BC (1-5, 1.80) Cologne Cardinals. INF Jeff Hunt, Cambridge, Ont. (.319, 2, 34) Mainz Athletics. OF Zach Johnson, Cranbrook, BC (.337, 4, 26) Mainz Athletics. OF Will Thorpe, Surrey, BC (.304, 5, 25) Munchen-Haar Desciples. 1B Mark Teahen, Redlands, Calif. (.235, 1, 10) Padova Tommasin. X-RHP Karl Gelinas, Iberville, Que. (0-1, 6.00) Puebla Pericos. SS Terrance “TR” Doty, Parksville, BC (.280, 1, 18) Sundbyberg Heat. 3B Wes Darvill, Richmond, BC (.309, 4, 49) Winnipeg Goldeyes. RHP Jared Mortensen, Abbotsford, BC (0-0, 7.50) Kansas City T-Bones; (8-1, 2.57) Texas Airhogs. LHP Evan Rutckyj, Windsor, Ont. (2-0, one save, 5.57) Winnipeg Goldeyes. OF Michael Crouse, Port Moody, BC (.262, 17, 62) New Britain Bees. X-RHP Eric Gagne, Mascouche, Que. (0-2, 12.27) Long Island Ducks. RHP Dustin Molleken, Regina, Sask. (3-1, three saves, 3.79) Somerset Patriots. RHP Phillippe Aumont, Gatineau, Que. (5-8, 4.51) Ottawa Champions. RHP Owen Boon, London, Ont. (1-3, 4.56) Trois Rivieres Aigles. X-LHP Guillaume Blanchette, St. Constant, Que. (1-5, 6.75) Trois Rivieres Aigles. OF Sebastien Boucher, Ottawa, Ont. (.296, 7, 51) Ottawa Champions. RHP Andrew Cooper, Belle River, Ont. (0-0, 5.03) Ottawa Champions. INF Phil Craig-St. Louis, Gatineau, Que. (.283, 5, 27) Quebec Capitales. X-OFCharles Demers, Levis, Que. (.000, 0, 0) Quebec Capitales. RHP Jean-Francois Dionne, Trois Rivieres, Que. (0-0, 5.52) Trois Rivieres Aigles. X-INF Jerome Duchesneau, Quebec City, Que. (.000, 0, 0) Quebec Capitales. LHP Ethan Elias, Entwhistle, Alta. (1-1, 4.82) Trois Rivieres Aigles; (0-1, 3.10) Rockland Boulders. X-LHP Jon Fitzsimmons, London, Ont. (0-0, One save, 0.00) Quebec Capitales. 3B Lachlan Fontaine, North Vancouver, BC (.262, 2, 14) Quebec Capitales. RHP Karl Gelinas, Iberville, Que. (9-3, 3.27) Quebec Capitales. X-RHP Tyler Gillies, London, Ont. (0-1, 4.15) Quebec Capitales. OF Tyson Gillies, Vancouver, BC (.294, 11, 50) Ottawa Champions. INF David Glaude, Quebec City, Que. (.222, 3, 25) Trois Rivieres Aigles; (.000, 0, 0) Quebec Capitales. OF Trevor Gretzky, Thousand Oaks, Calif. (.206, 2, 36) Trois Rivieres Aigles. X-RHP Curtis Johnson, Sudbury, Ont. (0-0, 4.32) Ottawa Champions. OF Marcus Knecht, Torono, Ont. (.242, 5, 43) Quebec Capitlales. 1B Jordan Lennerton, Langley, BC (.328, 14, 82) Quebec Capitales. X-INF Jonathan Malo, Laval, QC (.250, 0, 2) Quebec Capitales. X-2BAustin Marcellus, Oshawa, Ont. (.100, 0, 1) Ottawa Champions; (.353, 4, 38) California City Whiptails - Pecos League. INF Carter McEachern, Thunder Bay, Ont. (.288, 3, 29) Trois Rivieres Aigles. X-OF Moises Perez, Montreal, Que. (.200, 0, 0) Quebec Capitales. X-RHP Jaspreet Shergill, Vaughan, Ont. (2-1, 5.60) Quebec Capitales. RHP Bobby St. Pierre, Windsor, Ont. (0-0, one save, 1.41) Ottawa Champions. R-C Maxx Tissenbaum, Toronto, Ont. (.344, 13, 59) Quebec Capitales. C Larry Balkwill, Chatham, Ont. (.268, 20, 64) Windy City Thunderbirds. X-INF Billy Germaine, Aldergrove, BC (.298, 0, 7) Southern Illinois Miners. RHP Skylar Janisse, Maidstone, Ont. (6-3, 3.61) Joliet Slammers..
C Mike Blanke, Granby, Que. (.294, 5, 30) Vallejo Admirals; (.261, 0, 3); Cleburn Railroaders - American Association. (.200, 1, 4) Southern Maryland Blue Crabs- Atlantic League. RHP Aldo Ferrante, Toronto, Ont. (0-3, two saves, 5.40) California Whiptails. OF Ian Horne, Vancouver, BC (.391, 4, 43) Hollywood Stars. RHP Bo Lewington, Calgary, Alta. (0-1, 10.56) High Desert Yardbirds. RHP Kyle McKay, King City, Ont. (0-0, 16.20) High Desert Yardbirds. RJ Fuhr, El Segundo, Calif. (.213, 0, 6) Westside Woolly Mammoths.